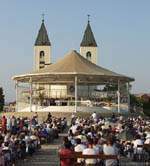 The parish of Medjugorje is situated in the region called Herzegovina, 25 km southwest of Mostar. 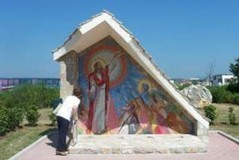 The name MEDJUGORJE is of Slavic origin and it means “area between two mountains”. The territory of the parish spreads out at an altitude of 200 metres above sea level and has a mild Mediterranean climate. The population at this time is about 4300 inhabitants. 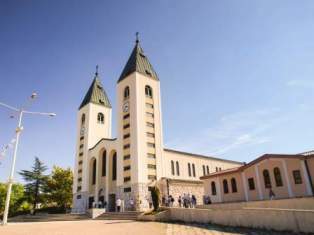 Our accommodation in Medjugorje was just a few minutes walking distance from Saint James Church and the main shopping area. Shops are in abundance, selling both cheap souvenirs and the more expensive and beautifully crafted items in gold and silver. Italian-style craftsmanship is evident in the many large and small statues we saw of Our Lady. An official bookshop next to Saint James houses a vast array of books, dvds, video tapes, etc. (as do other shops in town), all associated with the Medjugorje phenomenon. Even though commercialism abounds, it takes nothing away from the spiritual character of Medjugorje. The voices of people in prayer, the packed church services, the awesome feeling of being in a place of peace, the sharing of the wonderful experience of Our Lady’s presence, make any visit here very, very satisfying. Imagine a town where Mass in many languages is the central event of the day, where dozens of confessionals have long queues outside their doors, where exhortations to say the Rosary are ongoing, where people go out at night to silent adoration of the Blessed Sacrament - the biggest event in town. This, then, is Medjugorje. Jacov Colo - We started off with a visit to the home of Jacov Colo, one of the visionaries. Through an interpreter, Jacov outlined Our Lady’s mission as being one of peace and love. She has come to earth to re-educate us and to help us convert and re-centre our lives back to God. Jacov is married to Annalisa, an Italian, and they live in Medjugorje with their three children. Jacov was only 10 years old when he experienced his first apparition. His daily apparitions ended 12 September 1998. His prayer mission is to pray for the sick. Medjugorje Mass - The English-speaking 10am Mass followed our Jacov visit. A very moving experience, with the church packed with pilgrims. As predicted, it was standing room only for many of us. Guided tour of church grounds by our wonderful local guide Ainja Simovic - Ainja (who has since passed away - God rest her soul) was an Irish woman married to a local and lived in Medjugorje for some 20 years or so. It was around the 20th anniversary of the ongoing apparitions that people began to notice that the Risen Christ Statue was oozing an oil or water-like substance. Our New Zealand group witnessed this substance oozing from the Risen Christ’s right leg. No matter what time of day: early morning, afternoon, night-time, the substance continued to ooze. Michael K Jones states on his website, ‘Medjugorje USA’, that he has a local Medjugorje friend who informed him that a man took a paper napkin and reached to take a drop of oil from the Risen Christ Statue. When the man looked at the napkin, it is reported that the napkin was full of blood. A minimum of 50 people witnessed this. Because no scientific study has been done on the Risen Christ Statue, we can only ponder on what it all means. To some, however, no scientific study is needed and people in Medjugorje just accept the bleeding as a sign from God. Visit to grave of Father Slavko - Father Slavko Barbaric passed away at approximately 4pm Bosnian time on November 24, 2000 on Mount Krizevac. He was with some 70 pilgrims and parishioners on the Way of the Cross. He collapsed during the descent with an apparent heart attack. His final prayers were for the Holy Souls. Rosary, Daily Apparition, Mass, Adoration - The Saint James Evening Prayer Programme consists of praying the Holy Rosary Mysteries, the Daily Apparition, evening Holy Mass and Adoration of the Blessed Sacrament. Our group attended these services as part of a huge crowd encircling the exterior altar and the large Rotunda as the back of Saint James Church. A wonderful finish to our first full day in Medjugorje.